Fly to Tromsø and transfer with ‘Flybuss’ to the Clarion Collection Hotel With for 2 nights. 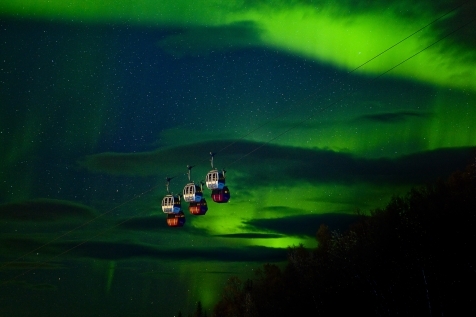 Depending on your arrival time you may want to join one of our optional Northern Lights tours. Tailor-make your stay in the ‘Capital of the North’ from our selection of optional excursions. (please contact us for full details) You will have plenty of time for an Arctic adventure. 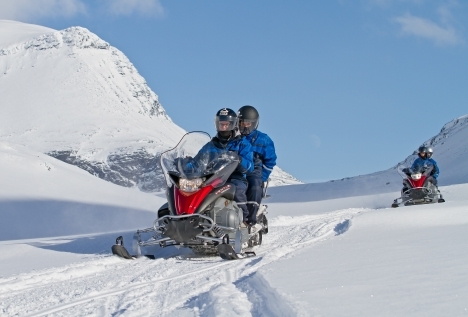 A snowmobile safari and husky mushing are always popular choices. This evening can also be spent in pursuit of the Northern Lights. Enjoy a plentiful breakfast before taking the early morning bus south to Narvik. The scenic 4-hour journey meanders through the glacial valleys and fjords of the Troms region. 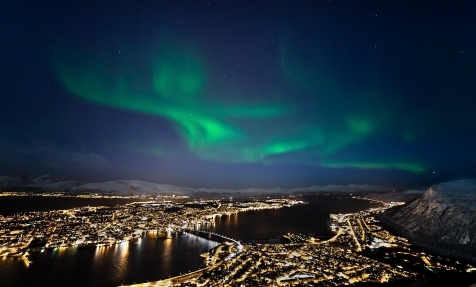 On arrival in Narvik, check-in to the Scandic Narvik and sample its designer delights. The rest of the day is at leisure. We recommend the Ofoten Museum, which chronicles the construction of the railway and the WWII battles that took place for the control of both Narvik’s harbour and all important iron ore. Alternatively, take the cable car to the top of Narvikfjellet for panoramic views of Ofotfjord. Fine dining can be enjoyed at the Linken Restaurant. Being 250 miles north of the Arctic Circle, there is every chance of spotting the Northern Lights. 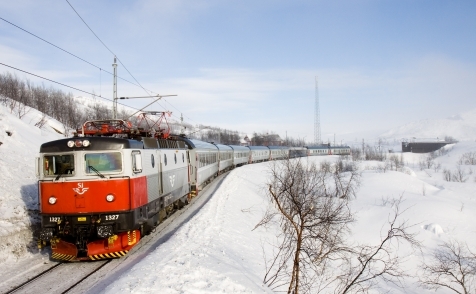 Board the Ofoten Line and Arctic Circle train for one of the most northern railway journeys in the world. The 3-hour journey initially hugs the shores of the Ofotfjord before ascending to its highest point at the border crossing of Riksangransen. There are no customs as you continue onwards crossing Abisko National Park before arriving at the former mining town of Kiruna. On arrival you will be met and transferred to the ICEHOTEL. Your accommodation for the night is a bed of ice, covered with reindeer skins topped with the warmest of sleeping bags. A whole host of activities await but first raise a toast to your journey in the ICEBAR whilst appreciating the fine ice carvings hewn by award-winning ice artists. Enjoy a warming hot berry juice and rejuvenating sauna before breakfast. Afterwards you will transfer to Kiruna Airport in time for your flight home to the UK (via Stockholm). The Scandic Hotel Narvik is located in one of the tallest buildings in Northern Norway, providing breathtaking views of the surrounding Ofotfjord and mountains. Situated within easy walking distance of the museums and attractions Narvik has to offer, this modern designer hotel is home to one of the best restaurants in Narvik and the Tøtta bar enjoys one of the best views. 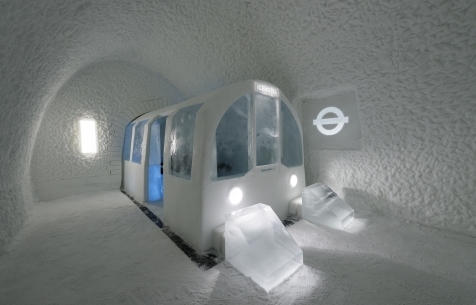 November 2016 saw the launch of ICEHOTEL 365, an innovative concept allowing guests to experience the unique atmosphere of the ICEHOTEL, year-round. ICEHOTEL 365 is a permanent structure that houses 22 art and deluxe ice suites, whereas the much-loved classic ICEHOTEL will be constructed in December and will accommodate up to 30 ice rooms and winter art suites. You can be assured that the ground-breaking, state-of-the-art designs and sculptures created by the specially commissioned artists and architects will continue to adorn both buildings and cement its position as the world's leading ICEHOTEL. ICE rooms: Simple but spacious snow rooms with ice decor and a privacy curtain. Winter Art Suite: Individually themed, designed and carved by hand, the Winter Art Suites are created by hand-picked artists from around the world. Each suite is unique and has never been created before. Guests are protected by a privacy curtain. Art Suite 365: Individually themed, designed and carved by hand-picked artists from around the world. Each unique suite has a door with lock to ensure privacy, as well as a private changing booth. Deluxe Suite 365: The largest of the suites on offer and features a heated relaxation area with private shower, sauna and en-suite bathroom, directly connected to your room. Each unique suite is individually themed, ornately carved and comes complete with a door and lock to ensure your privacy. Since its original conception in 1989, the owners of the ICEHOTEL have taken the surrounding snow and ice and morphed it into a fully functioning snow hotel. World famous sculptors transform huge blocks of ice into dramatic art, which then adorns the hotel and its rooms. Facilities include cold and warm accommodation; sauna, an ICEBAR, ice gallery and two restaurants, as well as a whole host of winter activities. Each spring, the structure was left melt back into the waters of the River Torne, however reinforcing its reputation for innovation, November 2016 saw the launch of ICEHOTEL 365, a revolutionary concept allowing guests to experience the unique atmosphere of the ICEHOTEL year round. ICEHOTEL 365 is a permanent structure that houses 22 art and luxury ice suites, whereas the much-loved classic ICEHOTEL will continue to be constructed each December and will accommodate up to 30 ice rooms and winter suites. You can be assured that the ground-breaking, state-of-the-art ice designs and sculptures created by the specially commissioned artists and architects will continue to adorn both buildings and cement its position as the world’s leading ICEHOTEL.